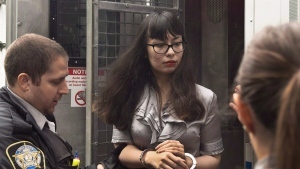 HALIFAX -- An American woman who plotted to go on a Valentine's Day shooting spree at a Halifax mall is appealing her sentence of life in prison, calling it "manifestly harsh and excessive." Lindsay Souvannarath was sentenced in April after pleading guilty to conspiracy to commit murder in a plan that would have seen two shooters open fire at the Halifax Shopping Centre food court in 2015. A motion to set a date for the appeal hearing is expected to be considered next week by Justice David Farrar of the Nova Scotia Court of Appeal. In her notice of appeal, Souvannarath argues that her sentence of life imprisonment with no chance of parole for 10 years should be revised to a fixed sentence of 12 to 14 years. The Chicago-area woman provides five grounds for appeal, including suggesting that the presiding judge committed an error by imposing a burden on her to prove she was remorseful and had "renounced anti-social beliefs." She also argues that Supreme Court Justice Peter Rosinski was wrong to compare the conspiracy to a terrorism offence and conclude it was equivalent in "moral blameworthiness, gravity and danger" to the public. The 26-year-old woman added that the judge offended the principle of parity by imposing a dramatically lengthier sentence on her than on co-conspirator Randall Shepherd. Souvannarath pleaded guilty last year, several months after Shepherd -- a Halifax man described in court as the "cheerleader" of the foiled shooting plot -- was sentenced to a decade in jail. A third alleged conspirator, 19-year-old James Gamble, was found dead in his Halifax-area home a day before the planned attack. The conspiracy can be traced back to December 2014, when Souvannarath and Gamble began an online relationship, exchanging explicit intimate photographs and a fascination with mass shootings. Thousands of Facebook messages between the two provide details of the conspiracy and Souvannarath's obsession with Nazism, the 1999 Columbine shooting and a plot she nicknamed "Der Untergang" -- a Valentine's Day shooting rampage at a Halifax mall. The massacre was to end with their own suicides. Souvannarath left her home in Geneva, Ill., on Feb 13, 2015, and flew to Halifax on a one-way ticket, allegedly carrying her "death outfit" and books on serial killers in her luggage. But the plan began to fall apart before she landed in Nova Scotia. Acting on a tip, police surrounded Gamble's home outside Halifax. He agreed over the phone to come outside, but instead shot himself in the head. Meanwhile, Shepherd went to the airport on a city bus to meet Souvannarath, but was arrested while waiting. Officers also sent online photos of Souvannarath to border agents at the Halifax airport, instructing them to detain anyone matching her description arriving on a flight from Chicago via New York. When Souvannarath arrived, she was detained by the Canada Border Services Agency. The arrests made international headlines and shocked Nova Scotians. The spectre of shooters opening fire in the food court of a popular mall threatened thousands of shoppers and workers and unsettled the city for months. One judge noted that it was difficult to imagine a crime more damaging to a community's sense of peace and security, while a Crown lawyer said the "horrible plan would have changed the face of Halifax forever." Rosinski cited the explicit intention to create mass panic and undermine the community's sense of security as an aggravating factor in the sentencing. "They intended to maximize dead and wounded casualties," the judge wrote in his decision.